What Is A Reflexology Massage And What Are Its Benefits? Though often referred to as a reflexology massage, reflexology is slightly different than a standard foot massage. Reflexology is a healing treatment that targets specific reflex points on the foot with pressure. It is said that these reflex points are connected to other organs and parts of the body via energy channels. When pressure is applied to the points it can remove blocked energy in those channels and allow the connected organs to begin healing. Reflexology has a very long history and has gone through several transformations over the centuries. Its earliest roots can be traced back to ancient Egypt and then to China. Its more modern roots took hold in the early 20th century. At the time, a well-known doctor by the name of William Fitzgerald introduced the idea of zone therapy. Other professionals compounded onto that idea until it became known as reflexology near the middle of the 20th century. Some patients are hesitant at first because of the use of words like “energy”, but it’s important to point out that there are several health benefits associated with reflexology massages that are proven and medically acceptable. Thus, even if opening energy channels doesn’t sound appealing to you, there are many other reasons to consider reflexology. Following is a closer look at some of the most significant benefits attached to reflexology. Some of these benefits are related to unblocking energy channels in the body and others are purely physiological. Blood circulation is an important component of your overall well-being. Poor circulation is a risk factor for a number of conditions and can lead to harmful side effects in patients with specific conditions, such as diabetes. Your blood is necessary for carrying oxygen, nutrients, and other compounds throughout the body. As your circulation worsens, less oxygen and fewer nutrients will be delivered, which leads to symptoms like decreased energy levels. The feet are the part of the body that is the furthest away from the heart. This means that they are often the first to experience symptoms associated with poor blood circulation. Some of these symptoms include varicose veins on the feet, hypertension, cramping, and blue coloring on the nails. The effects of massage on blood circulation have been studied for several decades. These same benefits apply to foot reflexology as well since it is mostly a massage technique that targets specific areas. Reflexology will actually move blood through areas of the foot when applying pressure, which then allows for new blood to flow in and circulation to improve. A second way that reflexology improves energy levels is by improving the functioning of the bladder. As mentioned, various points on the foot are tied via energy channels to specific organs. One of those channels is tied directly to the bladder. Reducing the blockage in that specific channel can improve bladder function and reduce the severity of urinary tract(UT) problems. But what does this mean in terms of energy levels? It means that the body is more capable of eliminating unwanted substances and dangerous toxins. Normally, those toxins might accumulate and attach to cells in the body causing damage. An increased number of damaged cells often leads to decreased energy levels. In a sense, the reflexology massage is working as a form of natural detox, which is known to increase energy levels. The reduction of stress is another amazing benefit tied to reflexology. It is a benefit tied to nearly all forms of massage, but the degree of stress relief from reflexology is greater than in many of the alternatives. Stress is a known risk factor for dozens of serious and potentially lethal health conditions. Having another tool for eliminating stress is always a great idea. A few other benefits include pain reduction, improved nerve sensitivity, better sleep, improved healing, and an overall improvement in the functioning of all organs. 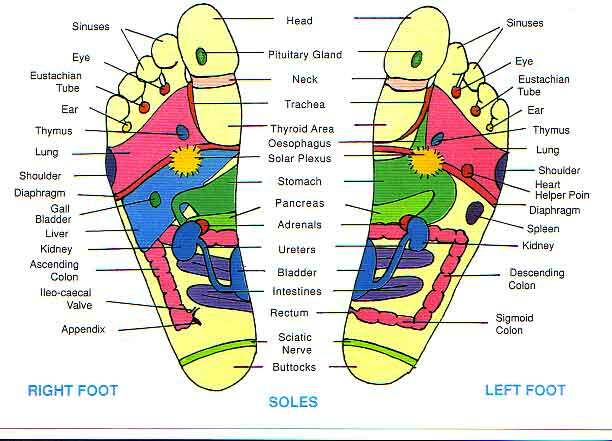 Reflexology is steadily growing in popularity and understanding. More and more studies are being conducted each year to determine exactly what is happening in the body and in what ways patients can benefit from this as a form of therapy. Reserve a massage session today to experience many of these benefits. Book now at Riviera Spa in Dallas.